The Mandarin Home Luxury Bamboo Bed Sheets are a pretty popular bed set. This bamboo bedding currently has a 4.5 star rating on Amazon, and they have a plethora of positive reviews. Even with those positive reviews, will they hold up under pressure? Let's dig in and find out. The Mandarin Home Luxury Bamboo Bed Sheets are made from 100 percent rayon derived from bamboo fibers. Often called bamboo viscose, it makes up the majority of bamboo fabrics, and the best bamboo sheets, on the market today. Most rayon viscose is made using the viscose process. This involves dissolving the bamboo cellulose in a strong solvent. This creates a pulpy solution that's forced through a spinneret and into another solvent that solidifies the cellulose strands into the fibers. These will then be used to make the thread and ultimately the rayon. Some of the chemicals used in the process of rayon include chlorine bleach, sodium hydroxide, sulfuric acid, and carbon disulfide. Due to this, the rayon tends to not retain much of the original bamboo. In fact, bamboo rayon sheets are required to be labeled as rayon made from bamboo fabric. This is because in 2009, the FTC (Federal Trade Commission) found that rayon made from bamboo really does not retain any of the antimicrobial properties of the bamboo plant. In addition, the manufacturing process is absolutely not eco-friendly as the process results in a lot of wastewater, along with harsh and toxic chemicals. While the process may not be eco-friendly, the rest of the sheets are very user-friendly. They are machine washable and dryer friendly. All that is required is that you stay away from high levels of heat because that can cause damage to the bamboo fibers. Other than that, the care level is fairly low and simple. Just use cold water when you wash them. When looking at what comes with the bed set, it is all pretty standard. While the company does not provide a chart with sizes, we do know what comes in the set. Inside the bedding set, you will get a fitted sheet, a flat sheet, and two pillowcases. This is all rather standard, but it is still nice to see. The Mandarin Home Luxury Bamboo Bed Sheets do not have many unique features included, but the benefits of these sheets are about the same as any other bamboo sheets. Of course, they regulate body temperature and are moisture wicking. This means that they are able to absorb moisture and radiate it back, thus giving the sheets a cool feel to them. The sheets are also hypoallergenic and stain resistant. One rather unique feature is that they are wrinkle resistant. Wrinkles are one of the major problems when it comes to bamboo sheets of any type, except a bamboo blend. And if you are a super neat freak, sheets that wrinkle may cause a lot of annoyance for you. Constantly ironing can get very tiring. Thankfully, from the looks of it, you will not have that problem with these. From looking at all of the critical reviews of the Mandarin Home Luxury Bamboo Bed Sheets, little to no one has complained about the sheets wrinkling. Unfortunately, there is no "About Us" section on their website, but their Amazon page seems to have nearly all positive reviews. They seem to have a few different bamboo fabric products for sale including duvet covers and sheets, all made from 100 percent rayon from bamboo. The Mandarin Home Luxury Bamboo Bed Sheets are made from one of the softest materials ever, rayon from bamboo. It is softer than Egyptian Cotton sheets and more durable as well. These sheets are wrinkle resistant, meaning less ironing and less stress about wrinkled sheets. That is, of course, if that stuff stresses you out. If you are looking for bamboo sheets that are easy to care for, you have come to the right place. 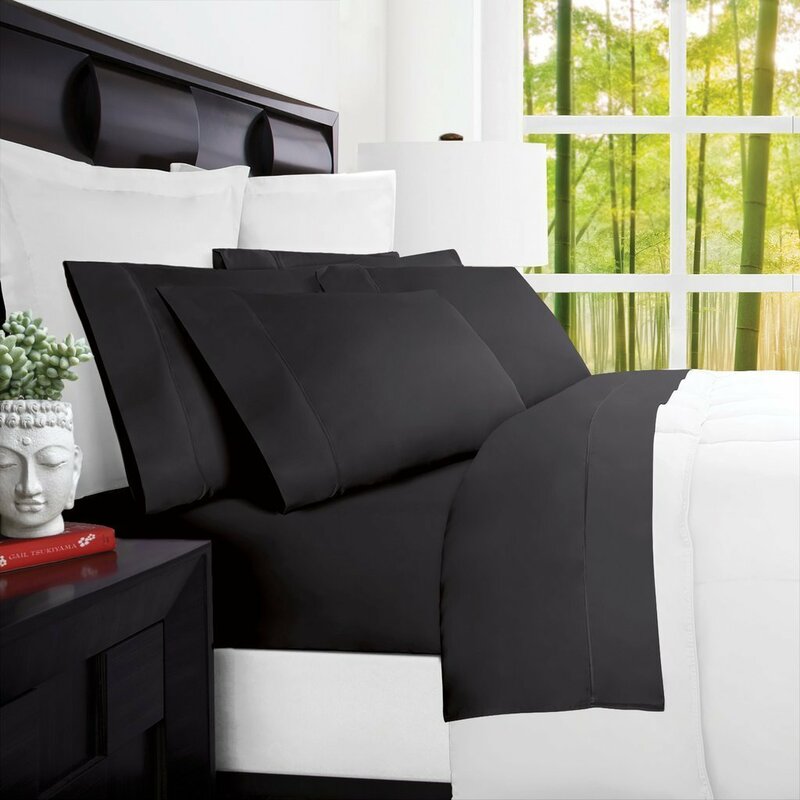 These Mandarin Home Luxury Bamboo Bed Sheets are stain resistant, machine washable, and dryer friendly. Just use cold water, avoid high levels of heat, and you will be fine. If you are unsure about these sheets but want to give them a try, there is a thirty-day guarantee. This means that if either something happens or you simply do not like them, you can return them for a full refund within thirty days. The biggest complaint from reading through the critical reviews of customers is that the fitted sheet does not have deep pockets and is rather small. This can be an issue if you have an oversized mattress or even are using a mattress topper. But thanks to the thirty-day guarantee, you can simply send them back if they don't work for you. The other common complaint is that you can damage them easily. A few people have shown pictures or experiences where the sheets tore after washing them or started to come away from the elastic. This can be a troublesome issue, especially after you have already spent the money on them. Now, the experiences shared by customers may be outlier instances and not the norm. If that is the case, then odds are you should be totally fine as long as you follow the recommended care for these sheets. Plus, as I said before, if anything actually does happen to your sheets within the first month, you can send them back for a replacement or a full refund. A gesture like that invokes a sense of confidence in the product, which is really nice. Overall, the Mandarin Home Luxury Bamboo Bed Sheets look like really great additions to your bed. Fortunately, if you find you do not like them, you can take advantage of that thirty-day guarantee. If you want to try them out for yourself, you can grab a King size bedspread on Amazon for $78.75. For any other information, including the best bamboo sheets, head on back to Green and Growing. Here are some top questions that I found for people seriously considering buying the Mandarin Home Luxury Bamboo Bed Sheets. What is the size of the fitted sheet's pockets? It does not have deep pockets; they are 15 inches deep. What is the thread count? The set packaging says that it is 300 thread count. Does the king set come with king sized pillowcases? Yes, it comes with two of them.